2014 – The year of retro-computing. For me, other than health issues which I won’t say any more about here, 2014 has been a year dominated by retro-computing sparked off by the call from the Museum of the History of Science in Oxford for exhibits for an exhibition they were setting up. The call went out in January, a little before my previous post (this is called “irregular” for a reason), and I responded by offering the use of my archive of machines. In the end they took up the offer of a Sinclair QL and a BBC Micro. Of course, this meant that I had to get the machines down from the loft to check them out, clean them and generally prepare them for the exhibition, which was going to start in May. The machines themselves proved to be in fine fettle but the floppy disk drives needed a bit of coaxing. The worst problem was that the lubricant used in the 1980s on the drives had mostly dried out to a sticky goo, the opposite of a lubricant. This took a little while to sort out. Another issue was getting a way to display the computers’ output. The LCD TV I used in my spare room as a monitor for my server does have an analogue TV input, along with HDMI, SCART, VGA etc. so it shouldn’t be a major problem. However, it’s obvious that the company Dixons/Curry’s chose to build their Sandstrom TVs never actually tested the analogue circuitry very well. Displaying anything with a defined, high-contrast signal produces at best multiple echoes of the point/line across the screen or, at worst, a smeared bright line to the left of the pixels. Not exactly useful for anything other than a quick test. This problem induced me to have to build new SCART video cables for the machines. A fiddly job at the best of times but not helped by the TV’s insistence in only displaying composite video through the SCART connector unless one pin is energised with 3 volts and with no way of overriding this in the menu system. Quite a pain when the computers required to connect don’t produce this voltage (and it’s not available from the TV’s SCART either). So, a battery box had to be installed and velcroed. What a pain. Anyway, by the time Easter came I had everything ready and delivery to the museum was planned after I got back from Cornwall. Unfortunately my health intervened and I was stuck down South for rather longer than expected, so missing the deadline for delivery. The museum managed to find a BBC Micro from someone else, along with my friend, Janet’s Beeb so they could set up without my stuff initially. 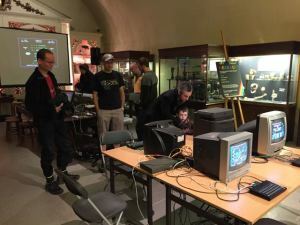 Thankfully I got back to Oxford just before the exhibition was to begin, so the team from the museum rocked up in a van and collected my QL, screen and floppy and they were deployed just in time for the opening. Unfortunately I was still too ill to go into town so a friend took a picture of the set-up for me. I was so glad everything had turned out OK. 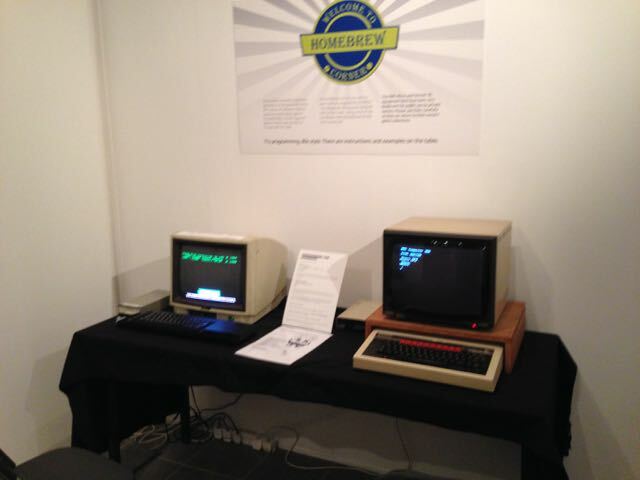 The Sinclair QL and BBC Micro doing public duty in the “Geek is Good” exhibition. 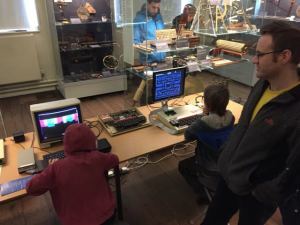 A few weeks later, after I’d become well enough, I travelled into town myself and took a look at the exhibition, “Geek is Good.” and realised that the materials in the hands-on display area were rather basic and used an arcane BASIC programming example which was really dull and, well, very 1970s. This spurred me into action. Being too unwell to go into work did allow me some time to use the energy I had to create a set of three programs for the BBC and the QL, exact equivalents in both BASIC dialects, and a crib sheet for program entry, explaining how to edit lines and simplify the typing in using the “AUTO” command. Far better. All this action at the museum also inspired me to “play” with the other machines in my collection, discovering in the process a few of them starting to die. For example, the Atari TT030 which seems to have developed a floppy controller fault, and the Acorn A4000 ARM machine where the rechargeable motherboard battery has burst, corroding the tracks and then the power supply died after I fixed this. These are really annoying failures as they’re the rarest of the machines. The ethernetted Sinclair ZX Spectrums in the basement of the Museum of the History of Science for the “Geek Out!” event. 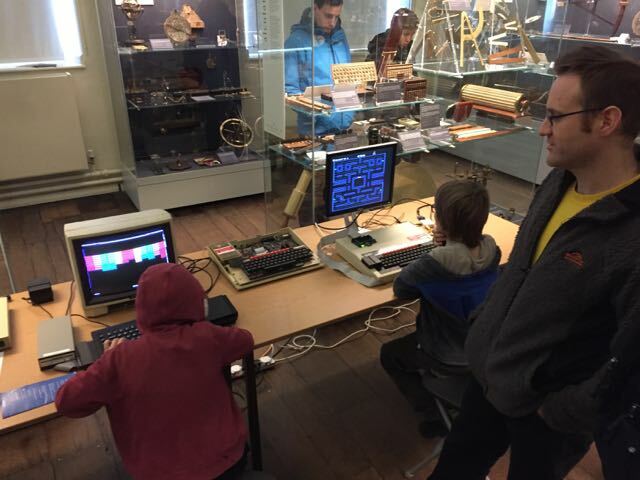 Anyway, I’ve had great fun with all this culminating yesterday with the Museum of the History of Science’s “Geek Out!” event, closing the year with ethernet networked ZX Sepctrums in the basement running games served from a MacBook followed by playing a symphony and BBC Micros in the upper gallery. The display in the Upper Gallery of the Museum of the History of Science. I’ve been testing and checking a second BBC Micro for the display all week, duplicating floppy disks of games all ready for yesterday morning. After arriving before 9am with the kit I took it up stairs and attempted to get it working. Hampered by not having the correct monitor cable I soldiered ahead but found that the floppy disk would no-longer read disks. Worse, the other BBC Micro wouldn’t do so either. Even after swapping drives etc. between the machines nothing worked! To save the day I asked Scott, the exhibition organiser, to get my Sinclair QL out of the store along with the floppy drive and a copy of “Arcanoid II”. The Sinclair saved the day! 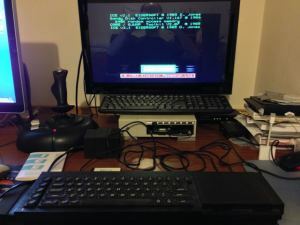 A BBC Micro with a board allowing an SD card to be used as a floppy disk drive and my Sinclair QL play games. Despite only having two games machines plus a BBC Micro sitting there for people to program upon the day went really well. The crowds were really interested and the kids were having a ball. 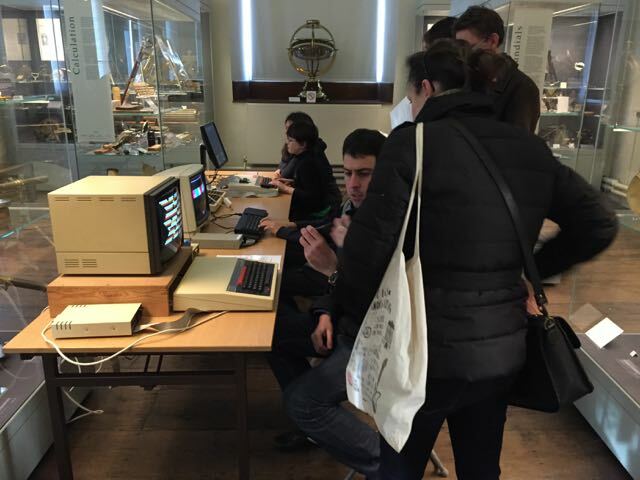 Surprisingly the BBC Micro set up for programming was as popular as the machines running games. One late teenager, who I think was South American, was fascinated with programming and asked where he might be able to get a BBC Micro. Also, a group of Italian Computer Science students found the machine highly interesting and wondered at how much could be done with so little coding. I think they may be searching for BBC Micro emulators now! And so, the end of the event came. I didn’t realise how tiring the day had been until I got home. I was shattered and almost fell asleep eating my dinner. Still, it was a good day. And now, the computers are back in their home in the loft. I’ll probably get the Beebs down one day to try to diagnose the floppy problem but probably not this year. 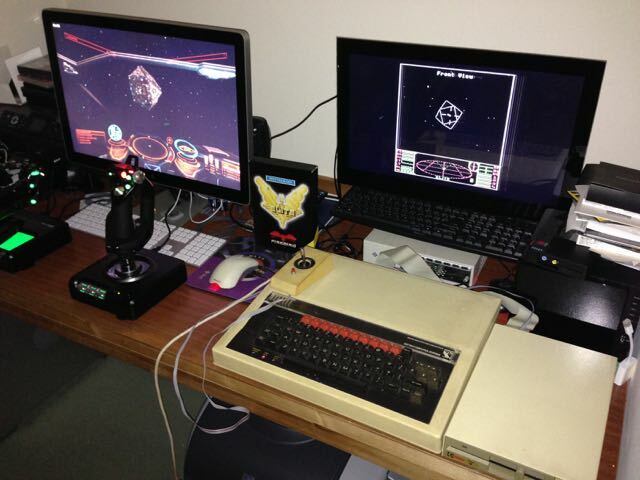 I’ve got other things to do, such as play the sequel to the 1984 smash hit on the BBC Micro, “Elite: Dangerous”! Docking at a Coriolis station in the original Elite on a BBC Micro and in Elite:Dangerous on a PC.